If only you'll do this and learn that. Damn, the how-tos are oozing out of my ears. If we looked into all of them, we won't have time to do anything else! But these ultimate solutions are not applicable to all, so it's ok to skip some of them for later. Okay, so a bestselling author talks about how he sold a million copies on Amazon. (Do I see a glimmer of greed in your eyes?) You want to learn how he did it. So you buy a slot in his webinar, and you listen to his strategies. That's when your brain matter starts to drip out of your nose and every other orifice in your body. He talks about funnels and email lists and the whole shebang. Now you feel like an incompetent cockroach who will NEVER achieve what he has done. So... how was that experience for you? Did it help? No. You just collected more baggage to add to your I'm-not-worthy pile. It's more effective to focus on a couple of goals at a time, rather than try to assimilate everything. These "experts" did not get to where they are in a day, or a month... You're seeing the result but not the process. The Z without going through A B C. They all started somewhere, and have built on their expertise for a long period of time. So, don't feel bad that they seem to be talking gibberish. You'll learn their language too, one day. Trying to swallow and digest everything all at once will only frustrate you, and make you feel like you're not doing enough. Like you're incompetent somehow. And that's what most "authorities" are going for. To make you feel incompetent so they can sell you their ultimate solutions. With the number of insecure authors wracked with self-doubt, I'm sure it's a lucrative business. But hey, chin up. Don't look at them. Look at you. What are you doing right now to reach your goals? Where are you now compared to when you started? What 2 crucial things do you need to master right now? Mastering a skill will make you feel successful. Able. Competitive. That's 2 less sources of self-doubt for you. Start there. Don't scatter yourself like a jigsaw puzzle. Focus. Do less, accomplish more. Never thought I'd ever say those words. I'm a multi-tasker who loves to-do lists. But... it's true. Spreading yourself too thin will just make you feel like a loser in so many areas. You don't want to feel that. Was that how I did it? No. I put everything in my plate and tried to eat all of them in one sitting. Sure, I was like a learning machine on steroids. But for a long time, I was stressed out of my skull. Not a good thing. Ask my husband. I know you feel like this most of the time. Like you can't catch up with everything you're supposed to do. I have many friends who simply stopped what they were doing because it overwhelmed them. These "need-to-dos". What you need to do is set yourself up for small wins. You can achieve this by mastering a couple of skills first. It will make you proud of yourself. More confident. It will keep you happy and moving forward. Once you've mastered something, then you can look into learning other skills. It's better to be an expert in one area than to be a dummy in everything. Right? Keep it simple, slow and steady. It takes time. 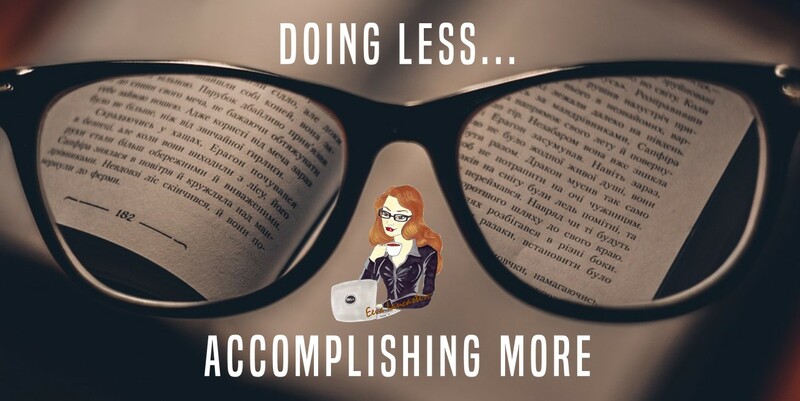 Do less, but focus, and you'll accomplish more. Try it, and let me know what 2 skills you've mastered. I'll just be here doing the same.